Lock in a great price for Visperhof – rated 8.9 by recent guests! Great choices for breakfast, the upgrades to the rooms were excellent. Room was well suited for work. They arranged to let me collect my key even though the front desk had closed. Right across from the train station in tiny Visp. Right in town street with it’s shops. Close to a pretty trail. Room nicely and comfortably renovated. Location to the train station and in a pedestrian zone. Walkable center city with lots of historical houses near the Rathaus. Staff was really nice, location couldn't be better, breakfast was good. Close to train station, friendly staffs, cleanliness. Next to the train station. This is fabulous because you can go everywhere in switzerland. Visperhof This rating is a reflection of how the property compares to the industry standard when it comes to price, facilities and services available. It's based on a self-evaluation by the property. Use this rating to help choose your stay! 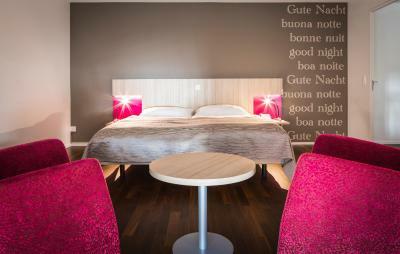 This 3-star hotel is a modern and trendy city hotel located in the car-free Bahnhofstrasse and contains modern yet comfortable rooms, as well as a private parking garage. 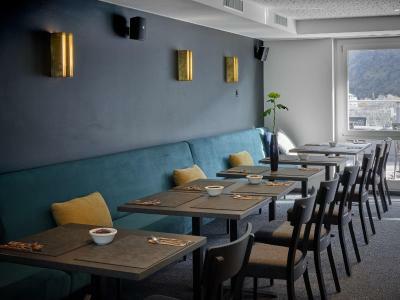 It is located near the railway station/PTT, on the Bahnhofstrasse, which is an ideal starting point for all your business in the upper Valais region. The hotel includes a restaurant and bar, as well as a terrace and a vending machine in the lobby. It also offers free internet access. It is located in the city center and close to the shopping center. The Lonza Group AG chemical and pharmaceutical company is 1,000 feet away. A shuttle bus to the Brigerbad thermal baths is available at a surcharge and guests can take advantage of reduced entrance fees. This property also has one of the top-rated locations in Visp! Guests are happier about it compared to other properties in the area. When would you like to stay at Visperhof? Spacious, room with attached bathroom with a balcony and free Wi-Fi. Room with attached bathroom with a balcony and free Wi-Fi. Spacious apartment with a kitchen and free Wi-Fi. The Visperhof is located with access to bus and train ideally and centrally. House Rules Visperhof takes special requests – add in the next step! All children from 3 to 5 year are charged 25 % of the room stay per night per person when using existing beds. All children from 6 to 11 year are charged 50 % of the room stay per night per person when using existing beds. All children from 12 to 15 year are charged 75 % of the room stay per night per person when using existing beds. One child under 3 years is charged CHF 20 per night in a crib. Visperhof accepts these cards and reserves the right to temporarily hold an amount prior to arrival. Please note that parking is provided at the Bahnhof parking garage. Once inside, please follow the signs for Visperhof. You can open the sliding gate (also marked with the hotel name) with your entrance ticket (on the left side of the gate). Please note that a maximum of 20 parking spaces are available in the garage. Please note that on Sundays, check-in is only possible until 20:00. Lobby was under construction. Seemed like it was understaffed for check in and check out. Had to wait quite a while. No reception staff upon arrival - self service for key after phonecall Room not cleaned upon arrival - had to call back for service Breakfast room full of dirty tables every day First day 'Do not disturb' sign used but entry into the room for cleaning Next 3 days no sign used but no cleaning - had to call again for service Stayed here already several years in a row but this was a very unpleasant experience. This used to be a very good hotel but service and staff is lacking on all levels. Serious lack of management to get things running like it should and where customers pay for. Reception under construction. The keys were at the first floor in a table in the middle of the corridor, nobody was there. The location and staff were good.